Discover birdwatching – grab a bird identification book, some binoculars and explore your area, especially the beaches, estuaries and headlands. There may also be a local club to join – ask your NPWS office or email us. • report unusual or interesting sightings through this website or to NPWS, or through your club. If walking your dog in or near shorebird areas, keep it on a leash and near the water so as not to disturb the birds. In breeding season, keep it right away from nesting sites. 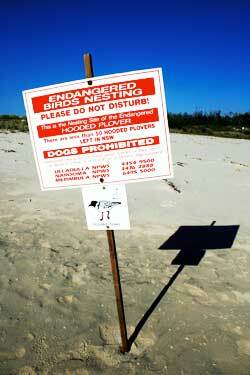 Educate other dog owners in responsible exercising of dogs in shorebird areas. When boating, be aware of birds and try and minimise disturbance while launching or landing your boat or canoe near their sites. Help reduce shoreline hazards by picking up dangerous rubbish such as fishing lines and plastics. Spread the word about shorebirds and sharing the shoreline. As much as we would like to be we can’t be everywhere! Our Shorebird Coordinators need your eyes and ears to help us know what is going on around the shoreline. You can report on interesting things you see or hear such as new nest activity, an unusual bird or a sudden change in shorebird activity. You can also report on threats to shorebirds such as transgressions by persons into nest areas, vandalism of our signs or fences, or even upcoming events such as king tides or an estuary flood. Try to get down as many details as you can at the time: time of day; number plates of vehicles, numbers of people involved; boat registration; descriptions – anything you think may be of use! Find out how to join our volunteer team – you can contribute as much or as little as you wish!